Opposite the Sultan Hassan mosque is the spectacular Refaai Mosque, with its overwhelming structure and stunning decorative items. When one looks at both mosques from a distance, one might feel that they are one mosque split into two. 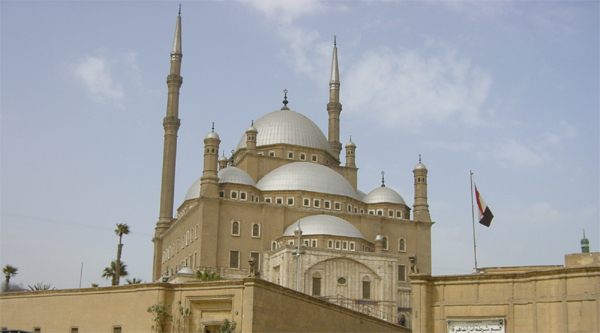 The Refaai Mosque has a similar grandeur to the Sultan Hassan Mosque, so that neither is dwarfed by the other. 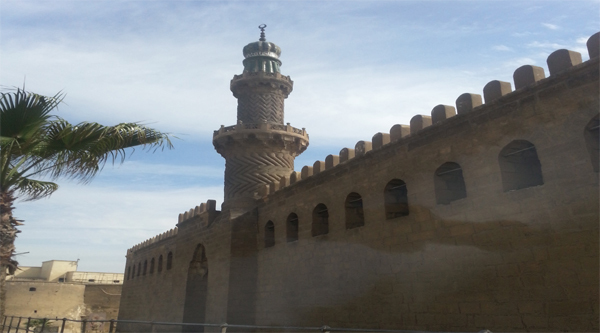 The Mosque was constructed in several phases between 1869 and 1912, when it was officially completed. It was built on the orders of Khushyar Hanem, the mother of Khedive Ismail, to be a burial place for her family and herself. 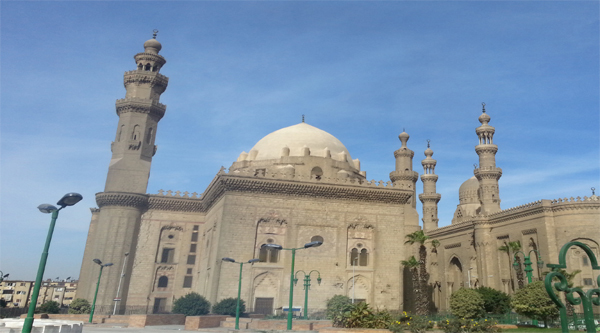 She assigned engineer Hussein Pasha Fahmi to design it in harmony with the Sultan Hassan Mosque. The Refaai Mosque was built over the mausoleum and zawia (chapel) of Sheikh Ali Al-Refaai, the grandson of the Sufi Refaaiya tariqa (sect) leader Sheikh Ahmed Al-Refaai. Ali Al-Refaai was considered a saint during his lifetime. The Refaai Mosque is rectangular in shape, measuring 6,500 square metres in size. Some 1,767 square metres of this area are reserved for prayer, while the rest is the mausoleum of the Mohamed Ali royal family. It was constructed in the Bahri Mamluk style popular in the 19th and 20th centuries. This style was similar to the European style of buildings at the time, and most of the materials used in the construction and decoration of the mosque were imported from Europe. The construction was moving ahead at a good pace until 1885 when Fahmi died, followed soon afterwards by Khushyar Hanem. She was granted her wish of being entombed there, and then in 1894, when her son Khedive Ismail also died, he was entombed next to her. These events placed the construction of the mosque on hold for almost 20 years, but when Khedive Hussein Helmi II came to the throne he assigned the Austrian architect Max Pasha Hertz, who at the time was head of the Committee for the Conservation of Arab Monuments in Cairo, to complete the construction. It was finished in 1912. 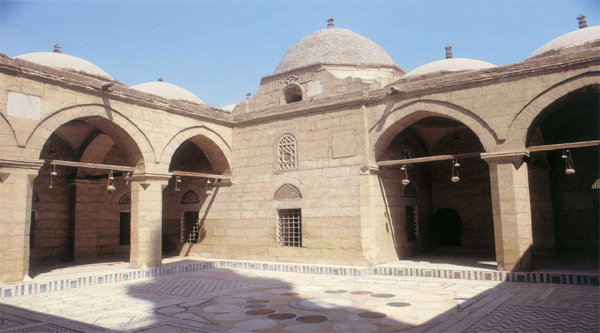 The mausoleum contains not only Khushyar Hanem and her son Ismail Pasha but also his wife and two daughters. Other members of Egypt’s royal family buried there are Sultan Hussein Kamel and his wife, as well as the last crowned king of Egypt, Farouk, whose body was returned to Cairo after his death in Rome in 1965. Farouk’s daughter Ferial was buried there in 2009. The mosque also served briefly as the resting place for the shah of Iran, Reza Shah Pahlavi, who died in exile in South Africa in 1944. His body was taken to Iran after World War II, but part of the burial chamber is currently occupied by Reza Shah’s son Mohamed Reza Pahlavi who died in exile in Cairo in 1980. The mausoleum is small but houses wonderful decorations. Its walls are covered with colourful marble designs and golden verses from the Quran. The floor and Pahlavi tombstone are of bright green marble. The tomb itself is merely a small step rising from the floor with the name of the shah and dates of his birth and death. The prayer hall is another distinguishing part of the mosque. The ceiling is beautifully decorated as it is stepped in a way that is similar to the ceilings in other historical Islamic buildings. The gold embellishing the ceiling was imported from Turkey at a cost of LE25,000, which was a very large sum of money at that time. 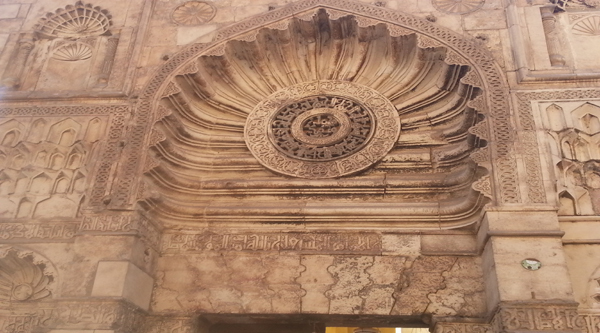 The walls of the mosque are covered with colourful marble in the various styles of the Mamluk ornamentation. There are 19 different types of marble from seven different countries. The prayer hall has 44 grand columns in all, as well as 18 intricately worked window grills. Of the structure's facades, the southern one is the most interesting. Its privileged position is more the result of its location facing the mosque of Sultan Hasan and its distance of less than ten meters away from it than of any inherent: design feature. The enormous height of both monuments and their proximity give the street between them a canyon effect. The necessarily acute view of that facade gives the impression that it is ignoring the viewer in favor of its historic neighbor. This southern facade and the northern facade of the mosque of Sultan Hasan frame a view centering on the mosque of Muhammad Ali. In spite of the restrictions imposed by the tight urban surroundings, this mosque was still designed as a free-standing object which would had been better suited for a large and open site. Nevertheless it does not present itself as a three-dimensional composition, but as a juxta-positioning of four separate sides: two of them are symmetrically arranged; on two, the northern and southern sides, the symmetry is partly broken by adding curved bays that connect each of them to the eastern facade. No clear effort was made to differentiate the front, side, and back facades, or to reflect the interior's formal or functional organization. 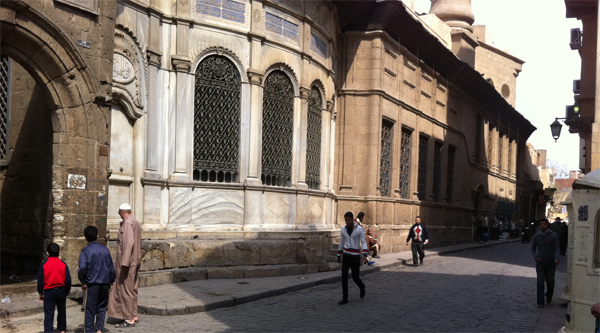 Because of its position facing Sultan Hassan Square, the western side is best qualified to call itself the main facade. It is the only one for which a full frontal view is available, and the only one which has a large central entrance. 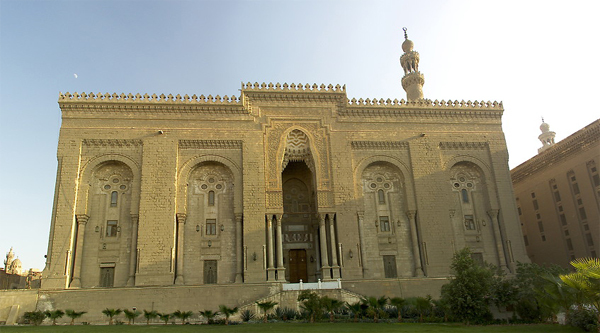 The southern one is also a contender, however, for it has a monumental arrangement centering on two large entrances, a dome, and two minarets; it is larger than the western one, and its left entry gate is the one currently used as the main public entrance. Even the remaining two, the northern and eastern sides, possess a monumentality that places them in competition with the first two . In terms of composition, the northern, southern, and western sides are all two-dimensional in design, but the eastern, or qibla, facade has two large projections on the sides that form a court in between and reflect a three-dimensional arrangement.